Are you curious to see where the future of VR is headed in the iGaming industry? So is VegasMaster! We took our questions to Jeff Lande, an industry VR pro. Lande is the founder of Lucky VR and developed the world’s first virtual reality casino for the Oculus Rift. He’s been working exclusively on creating VR casino games for the past two years. Previously, he was the founder of a daily fantasy sports website which was acquired in 2013. Check out our interview with Lande below to see what he had to say about virtual reality casinos and the future. 1. How did you start in the gaming industry and what drew you into it? I started in the gaming industry by founding a daily fantasy sports website when the concept first started to gain traction. I was an online poker player before that so was very familiar with how a peer-to-peer wagering site operated from the client side and jumped at the opportunity to use that knowledge to modernize fantasy sports. 2. Considering the risks involved in being one of the pioneers in the virtual reality casinos field, what inspired you to create Lucky VR? After trying the first VR development kit and seeing what the technology could enable it became clear that this was on a path to eventually disrupt many different industries from video games to education. When thinking about how it would apply to casino gaming, the industry that I knew best and was most passionate about, starting Lucky VR was an obvious step to see where I could take it. While it would be safer to go after an established platform like web or mobile where a large market with consumers already exists betting on VR seemed more exciting and offered greater rewards should VR become mainstream. 3. Looking ahead, do you think virtual reality gaming will become the cornerstone of future online casinos? In my opinion there’s no doubt that eventually virtual reality will be the way the vast majority of people play online casinos. Everything about an online casino from customer service to the actual gameplay is enhanced greatly by virtual reality. It’s just a matter of content getting better and hardware getting cheap enough so that VR has enough distribution to become the dominant platform for online casinos. 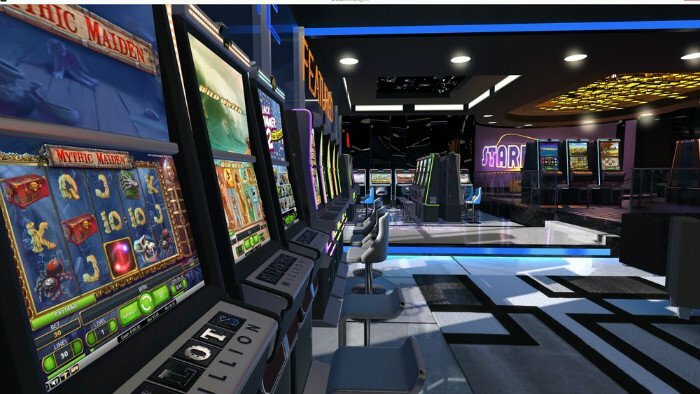 Casino slotsmillion.com is one of the pioneers of the VR casinos world, and uses Lucky VR software. 4. What do you think is the most important aspect when creating a virtual game? Is it the Game mechanics? Visual? Something else? The most important factor when creating a virtual reality casino game is player comfort. You have to sacrifice visual fidelity and plan movement mechanics and game interactions accordingly so that the player feels great in your game environment at all times. Once your game is comfortable then it’s all about adding in fun content and intuitive interactions that don’t disrupt the immersion of VR, it’s a delicate balancing act. 5. When looking at the current price tag for products like Facebook’s Oculus Rift and Samsung’s Gear VR headsets, do you believe virtual reality gaming has realistic potential to reach the mass crowd? High end VR like the Oculus Rift will not have mass adoption at it’s current price point but we expect the price to come down significantly over the next few years to where it could be more affordable. Having lots of big companies in competition to grab VR market share with their own headsets will also be beneficial for the consumers. In my opinion there’s no doubt that eventually virtual reality will be the way the vast majority of people play online casinos. Mobile VR headsets are already very affordable and many are being given away free like the Samsung Gear VR which is bundled with the new S7 smartphone. Mobile VR will definitely be a mass market product before high end VR and will act as a great acquisition tool for high end VR with people getting their first taste of VR using mobile. 6. From a software provider point of view, what are the advantages of casinos offering virtual gameplay? Can you pinpoint big changes in player behavior? Casinos will have much more access to their players and data from their players then ever before by offering VR. In a VR casino the operators will be able to engage with their users and actually talk to them and build a personal relationship. VIP players can be handled much more efficiently this way and offered better attention and perks similar to how they are treated in a live casino venue. In terms of analytics you don’t just know where a player is clicking and how long they spend playing a certain game like on web/mobile. In VR you can watch players in real time and see how they react to certain games or promotions and get their feedback in person virtually. 7. Have you learned anything from case studies regarding format innovations that failed to take off, such as the 3D TV or former 3D gaming? VR itself had a failed launch 20 years ago and didn’t takeoff and I think the biggest learning form that and from those other technologies that failed to gain traction was that the technology itself really has to be at a point where it’s good enough. For VR specifically in its first launch 20 years ago most people who never tried VR wanted the tech to become available as soon as possible because they thought it was ready and imagined it worked like in Sci-Fi movies. But the people who did try it then would say that it made them nauseous. This time around the mass market is skeptical about VR while everyone who has tried the current VR headsets can’t say enough about how great it is. Jeff Lande talks to Swipe (Sky News) about the potential of VR Casinos Gameplay. 8. How long do you think it will take before virtual reality tech can truly mimic real land-based casinos? An exact timeline is hard to predict but VR is improving at breakneck speeds and in the next 5-10 years you should be seeing some extremely compelling casino content that can not only truly mimic a land-based casino but also augment it to make it even better than what’s possible in real life. 9. Going forward, what do you think are the challenges that the industry currently faces? The challenge the industry will face is a slow adoption curve to get to a sizeable user base that will warrant enough investment to create AAA VR casino content for. Many of the early VR adopters are buying the technology to play video games with and this demographic is not your typical casino player. It will take some time before the people who want to play casino games online are also the people with VR headsets at home. 10. Can you discuss Lucky VR’s plans for the future? Lucky VR plans to continue to create the best VR casino content available. VR development has so many new learnings that are constantly changing that it really takes specialization to create something great. We continue to learn VR best practices and create compelling casino content for all VR platforms. We’re excited to bring casino gaming to VR and see where it can go. For more information on Virtual reality in online gambling click here.